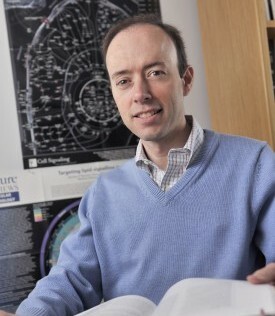 “These studies, which were performed in collaboration with Genentech Inc., identify novel therapeutic targets and suggest that predisposition to kidney cancer across species may be explained, at least in part, by the location of tumor suppressor genes with respect to one another in the genome,” said Dr. James Brugarolas, Associate Professor of Internal Medicine and Developmental Biology, who leads UT Southwestern’s Kidney Cancer Program at the Harold C. Simmons Cancer Center. The scientists’ findings are outlined in separate reports in the Proceedings of the National Academy of Sciences and Nature Genetics. More than 250,000 individuals worldwide are diagnosed with kidney cancer every year, with lifetime risk of kidney cancer in the US estimated at 1.6 percent. Most kidney tumors are renal cell carcinomas, which when metastatic remain largely incurable. Researchers with UT Southwestern’s Kidney Cancer Program had previously identified a critical gene called BAP1 that is intimately tied to kidney cancer formation. Their latest research shows how BAP1 interacts with a second gene, VHL, to transform a normal kidney cell into a cancer cell, which in part appears to be based on the two gene’s close proximity in humans, said Dr. Brugarolas, a Virginia Murchison Linthicum Endowed Scholar in Medical Research. The newest findings suggest that the transformation begins with a mutation in one of the two copies of VHL, which is the most frequently mutated gene in the most common form of kidney cancer, clear cell type, which accounts for about 75 percent of kidney cancers. The VHL mutation is followed by a loss of the corresponding chromosome arm containing the second copy of VHL, as well as several other genes including PBRM1 and BAP1. This step eliminates the remaining copy of VHL and along with it, one of the two copies of PBRM1 and BAP1, two important genes that protect the kidney from cancer development. The subsequent mutation of the remaining copy of BAP1 leads to aggressive tumors, whereas mutation of the remaining copy of PBRM1 induces less aggressive tumors, said Dr. Payal Kapur, a key investigator of both studies who is an Associate Professor of Pathology and Urology, and the Pathology co-Leader of the Kidney Cancer Program. This model also explains why humans born with a mutation in VHL have a high likelihood of developing kidney cancer during their life time. In these individuals, all kidney cells are already deficient for one VHL copy and a single deletion eliminates the second copy, along with a copy of BAP1 and PBRM1. In contrast, in other animals, these three genes are located on different chromosomes and thus more mutational events are required for their inactivation than in humans. Consistent with this notion, when UT Southwestern researchers mutated VHL and BAP1 together, kidney cancer resulted in animals. In a second collaborative study with Genentech Inc., published in Nature Genetics, investigators implicated several genes for the first time in non-clear cell kidney cancer, a less common type that accounts for about 25 percent of kidney cancers. Researchers identified a gene signature that can help differentiate subtypes of non-clear cell tumors to better define their behavior. Specifically, the researchers characterized alterations from 167 human primary non-clear cell renal cell carcinomas, identifying 16 significantly mutated genes in non-clear cell kidney cancer that may pave the way for the development of novel therapies. The research team also identified a five-gene set that enabled molecular classifications of tumor subtypes, along with a potential therapeutic role for BIRC7 inhibitors for future study. Other UT Southwestern researchers involved included Dr. Renee McKay, Assistant Professor of Developmental Biology and Director of Research Administration of the Kidney Cancer Program; Dr. Ivan Pedrosa, Associate Professor of Radiology and the Advanced Imaging Research Center, and Radiology co-Leader of the Kidney Cancer Program, who holds the Jack Reynolds, M.D., Chair in Radiology; Dr. Robert E. Hammer, Professor of Biochemistry and the Green Center for Systems Biology, who holds the Graydon Heartsill Professorship in Medical Science; Dr. Xian-Jin Xie, Associate Professor of Clinical Science and the Harold C. Simmons Cancer Center; Dr. Dinesh Rakheja, Associate Professor of Pathology and Pediatrics, who holds the John Lawrence and Patsy Louise Goforth Distinguished Professorship in Pathology; Dr. Thomas Carroll, Associate Professor of Internal Medicine and Molecular Biology; Dr. Vitaly Margulis, Associate Professor of Urology; Dr. Yair Lotan, Professor of Urology, who holds the Helen J. and Robert S. Strauss Professorship in Urology; Dr. Arthur Sagalowsky, Professor of Urology and Surgery, and Urology co-Leader of the Kidney Cancer Program, who holds The Dr. Paul Peters Chair in Urology in Memory of Rumsey and Louis Strickland; Dr. Nick Grishin, Professor of Biophysics and Biochemistry, and a Virginia Murchison Linthicum Scholar in Biomedical Research; and researchers Andrea Pavía-Jiménez, Shan-Shan Wang, Yi-Feng Gu, Nicholas Wolff, Karoliina Stefanius, Alana Christie, Sadia Saleem, Samuel Peña-Llopis, Eboni Holloman, Haley M. Hill, and Lisa N. Kinch. The latest findings were made in conjunction with Genentech Inc., a leading biotechnology company that discovers, develops, manufactures and commercializes medicines to treat patients with serious or life-threatening medical conditions. The company, a member of the Roche Group, has headquarters in South San Francisco, California. UT Southwestern’s Kidney Cancer Program includes more than 20 physicians, many of whom are renowned international leaders in their fields of urology, adult and pediatric oncology, radiation oncology, radiology, and pathology. In addition, more than 50 research laboratories are affiliated with the Kidney Cancer Program. The Kidney Cancer Program launched in 2013 to build upon landmark discoveries made by scientists at UT Southwestern over the last three decades. Dr. Steven McKnight, Chairman of Biochemistry, and Dr. David Russell, Vice Provost and Dean of Basic Research, discovered HIF-2α, a protein that mediates kidney cancer development. Subsequent studies by Dr. Richard Bruick, Professor of Biochemistry and holder of the Michael L. Rosenberg Scholar in Biomedical Research, and Dr. Kevin Gardner, Adjunct Professor of Biophysics, paved the way for the development of a drug that blocks HIF-2 activity by Peloton Therapeutics, Inc., a UT Southwestern start-up company founded by Dr. McKnight and now operating in UT Southwestern’s BioCenter. In addition, researchers at UTSW discovered that the TSC1/TSC2 complex regulates TOR, which is the target of two kidney cancer drugs. Years later, Dr. Brugarolas identified mutations in TSC1 in kidney cancer, and the presence of these mutations may identify patients most likely to respond to TOR inhibitors. Finally, recent discoveries by several investigators at the Kidney Cancer Program determined that there are different subtypes of kidney cancer with different biology and outcomes. Dr. McKnight holds the Distinguished Chair in Basic Biomedical Research and The Sam G. Winstead and F. Andrew Bell Distinguished Chair in Biochemistry. Dr. Russell holds the Eugene McDermott Distinguished Chair in Molecular Genetics. UT Southwestern’s Harold C. Simmons Cancer Center is the only National Cancer Institute-designated cancer center in North Texas and one of just 66 NCI-designated cancer centers in the nation. The Harold C. Simmons Cancer Center includes 13 major cancer care programs with a focus on treating the whole individual with innovative treatments, while fostering groundbreaking research that has the potential to improve patient care and prevention of cancer worldwide. In addition, the Center’s education and training programs support and develop the next generation of cancer researchers and clinicians.